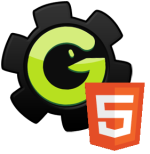 The HTML5 GameMaker page on the new YoYo Games website has recently been expanded to provide additional information about what will be the next new version of the software to be released. Small post. But have seen no mention of even the possibility of a team collaboration elsewhere. Queue the speculation! Small post. Could have waited till something else is announced. A thing to wonder about is if ‘collaboration feature’ will be implemented through connection between computers (thus depend on actual connection), or a file(s) on a remote host (subversioning?). External JS libraries would extend possibilities of game creations, however its a question if (and how) they will be able to interact with GM’s canvas. Also this would draw the HTML5 GM games [nearly] entirely incompatible with normal GM games. Small comment. Could have waited for more to comment on.